New Mum Online: Ate a Jar and I liked it ....... !!!!! Ate a Jar and I liked it ....... !!!!! Organic Vegetable & Chicken Sunday Lunch. He only had a few spoonfuls and started turning his head away. Then he just had half of his "bottle". 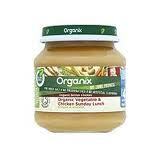 So Organix hear here, Aaron does NOT like Organic Vegetable & Chicken Sunday Lunch **. And I don't think it's just the teething... I genuinely think he doesn't like the thick potatoey texture as he loves the others. We are huge Organix fans in this house. No, I am NOT crawling... I know you have sponsored someone already... Just that we really are, and he loves the rice cakes tooooooooo. Is that terrible???? I know some people will be like yuk, but in my mind I wouldn't get Aaron to eat anything I am not prepared to eat myself... so there! After all it is not dog food, it is food for our nearest dearest and precious one... BUT LIKE AARON, I have tasted better *** ... sorry Organix. ** I think he ate one in Ireland so maybe it's just a teething thang! *** I know this goes against the subject heading but they are not a contradiction. You can like something AND have tasted better. Some of their other jars are truly scrumptious! My son was a strange one with the jars! If he liked one flavour he would have to stick with the brand it was from and wouldnt say have a organix chicken dinner when hes already tried a heinz one and liked it. Weird child, I blame the father!